Synthetic peptide within Human ThPok aa 313-362 (internal sequence). The exact sequence is proprietary. HepG2 cell lysate, Human heart and human lung tissue. Our Abpromise guarantee covers the use of ab23388 in the following tested applications. WB Use a concentration of 1 - 2 µg/ml. Predicted molecular weight: 60 kDa. Good results were obtained when blocked with 5% non-fat dry milk in 0.05% PBS-T. Transcription regulator that acts as a key regulator of lineage commitment of immature T-cell precursors. Necessary and sufficient for commitment of CD4 lineage, while its absence causes CD8 commitment. Development of immature T-cell precursors (thymocytes) to either the CD4 helper or CD8 killer T-cell lineages correlates precisely with their T-cell receptor specificity for major histocompatibility complex class II or class I molecules, respectively. Transcriptional repressor of the collagen COL1A1 and COL1A2 genes. May also function as a repressor of fibronectin and possibly other extracellular matrix genes. Western blot analysis of Human fetal liver tissue lysate labeling ThPok with ab23388 at 1.0µg/ml. HRP conjugated anti-Rabbit IgG diluted in 1: 50,000 - 100,000. Immunohistochemical analysis of ThPok expression in paraffin embedded human heart tissue section. ab23388 was used at 4 ug/ml. Arrows indicate the positively labelled myocardial cells. 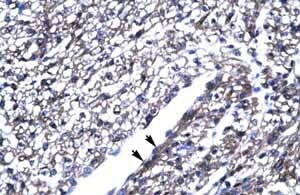 Immunohistochemical analysis of ThPok expression in paraffin embedded human lung tissue section. ab23388 was used at 4 ug/ml. Arrows indicate the positively labelled alveolar cells. ab23388 has not yet been referenced specifically in any publications. Publishing research using ab23388? Please let us know so that we can cite the reference in this datasheet. I am looking for an Anti-ThPok antibody for a rat cell line, for Western blots. I see that ab70991 reacts with mouse and human, which makes me think it should work with rat but you don't say if it is predicted to do so. On the other hand, you show ab23388 as reacting just with human, but predict it will react to rat (you don't predict it will react with mouse, which seems surprising). Can you tell me whether I am better off trying ab70991 or ab23388? The better choice will be ab70991, as the immunogen is 100% conserved in rat ThPok. The immunogen for ab23388 is conserved 85%, so reactivity is predicted, but is less probable than ab70991 reactivity. I am interested in a gene zbt7b which is the homolog of human th-pok gene. I see that you have a lot of primary antibodies which are generated against th-pok gene but I could not find their epitope on the your web. I want to know will they are also reactive against my gene. Here is the protein sequence of my gene. Could you please help me and tell me the antibody which will be specific for my gene and I can use in my chip experiments. I am sorry to confirm that non of our thPok antibodies have been tested and guaranteed in Xenopus tropicalis. I have checked the alignment of the sequence you kindly provided with the immunogen sequences for the antibodies we have. Regrettably, these all show very low alignment which means the antibodies are very unlikely to detect in Xenopus tropicalis. I am sorry this is not better news and that we do not have antibodies that would meet your requirements on this occasion. We need the antibody for murine ThPOK. On data sheet, your Ab for hThPOK has not been checked if it detect other species. Could you sent us your Ab in small scale to check it works for mThPOK or not? We will buy it if it works. Thank you. Thank you for your enquiry. We do not routinely offer free or trial sized samples for testing purposes. Our policy at Abcam is that if an antibody does not work as specified on the datasheet, we will offer a replacement or reimbursement. To our knowledge, this antibody has not yet been tested with murine samples. However, I did a sequence alignment of the amino acid range listed for the immunogen and the murine sequence, and found that there is 85% homology within that range, with long stretches of matching amino acids. So it is possible that the antibody will cross-react. Should you decide to go ahead and purchase this product, please let us know how you get on by submitting an Abreview and in return we will offer you 50 Abpoints which can be redeemed on a number of rewards (a further 100 Abpoints will be offered for an image). I hope this information helps, please do not hesitate to contact us if you need any more advice or information. 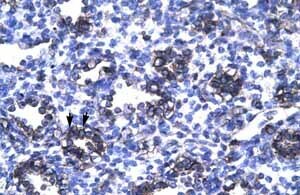 What is the epitope recognized by this antibody? Is the peptide sequence that was used available? If not, could the first 5 or 6 amino acids be provided? Thank you for your phone call. The sequence of the synthetic peptide used for immunization is as follows: AQGGGPPLSPEELGSDEDAIDPDLMAYLSSLHQDNLAPGLDSQDKLVRKRRSQMP. It represents a part of a region from AA residue 291 to AA residue 345 of ZFP67 (NP_056956 in NCBI database). If you have any additional questions, please contact us again.